From the Kendra Scott Summer 2017 collection, the Kingston necklace features a pendant that boasts the bestselling ivory mother-of-pearl colorway in the new fan silhouette. The Kendra Scott fan custom shape boasts a modified and shortened version of the popular KS Alexandra style, as well as irregular faceting for a natural look. 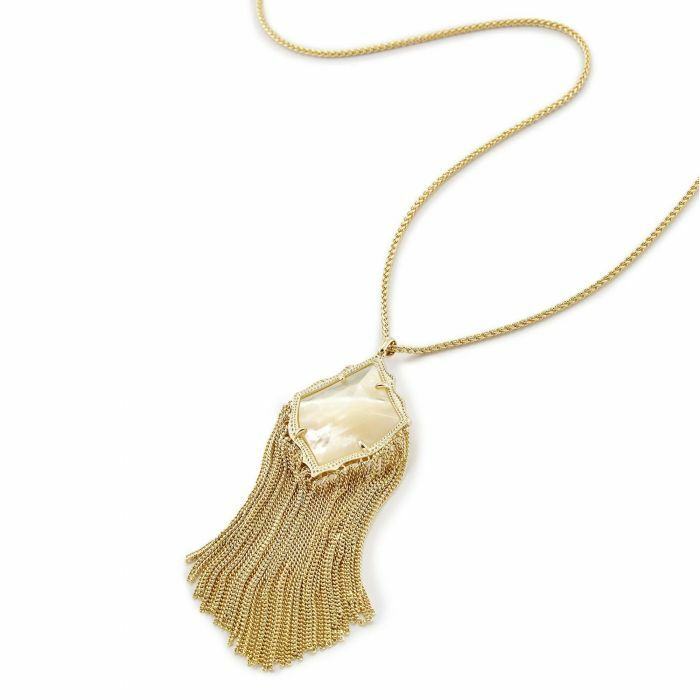 The frame of this unique pendant has an intricate scalloped edging, while a waterfall of tassels drop down from the pendant, creating an exotic look that is perfect for warm weather. This necklace is 14k gold-plated over brass and is 32" in length with an adjustable sliding clasp closure. This versatile closure allows you to adjust this necklace and wear it at your perfect length. The stationary pendant measures 4.25" in length and 1.6" in width.